Do you remember what you were doing when you were thirteen years old? Me? I was playing sports and doing homework. I was worried about finishing up the 8th grade and trying to finagle a few extra minutes on my bedtime. What I wasn’t doing was making decisions about what college I was going to attend. Apparently, I wasn’t doing quite enough because last week a thirteen year old in Raleigh, NC verbally committed to play basketball at North Carolina State University in 2019. That’s right, before Jada Peebles made it to or through high school, she decided exactly where she will go to college and what she’s going to do while she’s there. The daughter of NC State football legend, Danny Peebles, Jada has dreamed of being a member of the Wolf Pack since she knew what college was. And now her talents on the court have paved the way for her to do so in the not too distant future. Peep the video…she’s nice. I think it’s amazing that Jada is such an ambitious and determined young lady. It’s always encouraging to see young female athletes making headlines for being talented and bold. 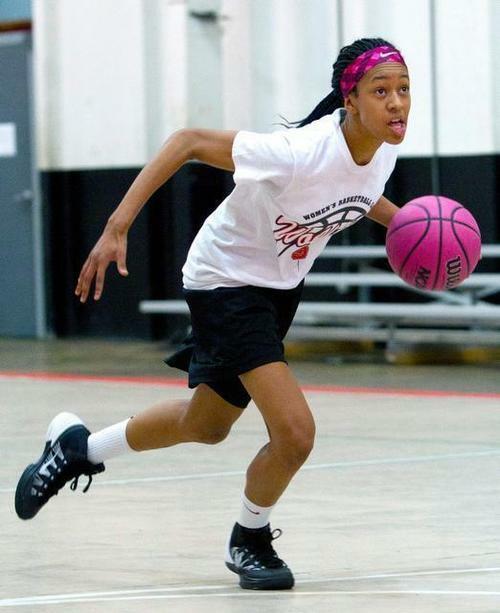 While Jada’s accomplishments thus far are worthy of applause, she isn’t the first and likely won’t be the last middle schooler to verbally commit to a college. This makes me wonder if it is really a good idea for middle schoolers to be make somewhat formal, public decisions about where they will attend college 4 or 5 years down the road. Initially, it seems like a great idea. A young student-athlete is able to solidify where he/she is going to go to school and how it will be paid for. With such a weight lifted off of their shoulders, they can focus on thriving in the classroom and in their respective sports without worrying about impressing a long list of coaches and recruiters. For the school, it allows the coaching staff to plan ahead by establishing rosters in advance, and to focus on other recruiting athletes for other positions. It’s a win-win situation…or so it appears. The issue with allowing middle schoolers to verbally commit to a particular college and for those colleges to verbally commit to them is that the commitments, while an important part of the recruiting process, are nonbinding. While a verbal commitment for a student-athlete to attend a particular school (and for that school to finance that student-athlete’s education) amounts to a promise between the parties; at any time, either party is free to walk away—a student can commit to another school and a school can revoke its offer. When the student-athlete is only in middle school, this level of uncertainty can be a gift and a curse*. Kids can be pretty finicky and unpredictable, so the nonbinding nature of the commitment is perfect for the middle schooler who is very likely to be interested in different schools as the years and their maturity progress. Young student-athletes have the freedom to explore other options should they later realize that a certain school isn’t the right fit for them. After all, it doesn’t seem quite right to bind an adult to a decision they made as a child anyway. The unpredictability of children is exactly why the nonbinding nature of the commitment is a gift for the school. Between middle school and college any number of things can happen to a young student-athlete. He/she could become interested in a different sport; his/her grades could drop significantly; or he/she could fall in rankings in their sport. If a young student-athlete becomes a less than desirable candidate for a particular school, the nonbinding verbal commitment gives schools the freedom to cancel its offer of a scholarship rather than waste a scholarship on a student-athlete who no longer deserves it or is no longer a good fit for the school’s program**. While the nonbinding nature of the verbal commitment provides both parties with a desirable amount of freedom, it can also be the source of stress and anxiety. If a middle schooler is not clear about the true meaning of a verbal commitment, he/she could gain a false sense of comfort believing that the verbal commitment is a binding agreement. For many pre-teens who have been taught to keep their word, it may be difficult to understand that while the coach did promise a scholarship he/she could change their mind at a later date. Additionally, this false comfort zone may also inadvertently encourage the student to ease off his/her studies and practice habits because they have the belief that their college education is already paid for. It doesn’t seem farfetched or unreasonable for a student, who has been taught that his/her efforts in the classroom and on the field are necessary to secure a free education, to feel a false sense of accomplishment after receiving a verbal commitment of free education and act accordingly. This lack of finality can also have an unsettling affect on a school’s coaching staff. While getting early verbal commitments from students is a recruiting tool that allows coaches to plan ahead, the nonbinding nature can also create gaps in teams and a level of uncertainty for the coaching staff. Should a school prepare for a student to be a member of their team in the future and later that student decides that they no longer want to attend, the school could be left scrambling to fill the void the student’s change of heart has created. And while many middle schoolers may not be able to fully comprehend the non-binding nature of the verbal commitment, schools certainly do. This awareness may actually place more burden on a coaching staff who is forced to actively recruit for non-filled positions while simultaneously checking on the status of students who they made commitments to years ago. Don’t get me wrong, I’m not suggesting that the gift and the curse of the early middle school verbal commitment are reasons to do away with the practice. However, I do think there is cause for caution. The parents of talented young student-athletes faced with offers from schools while their child is in middle school should thoroughly weigh their options before deciding to commit to a particular program. On the one hand, they could forgo making any decisions about college while in middle school (and maybe even during the first couple of years of high school). This would allow their child to continue to enjoy their childhood and make the decision later when they are more mature and capable of understanding the ramifications of the verbal commitment and the importance of choosing a college wisely. If the child progresses as parents and coaches believe he/she will, those same colleges (and probably more) will be just as interested a couple years down the line as they were when the child was in middle school–so there won’t be any missed opportunities. On the other hand, parents could allow their children to make the decision about where to go to school while in middle school and prepare accordingly. This option may allow the young student-athlete to breathe easier knowing that their middle school and high school careers will be less burdened with calls and visits from persistent recruiters. Should parents choose this option they should (as with the other option) be prepared to thoroughly explain what the verbal commitment does and does not do. Whatever the option parents and their children decide it should be based on each individual child’s temperament, maturity and understanding. What works for one child may not work for the next. As college sports continue to grow, parents and young student-athletes can continue to expect to be faced with tough decisions earlier and earlier in life. Every program wants a competitive edge so they will be persistent about pursuing young talent. It is up to parent to become knowledgeable and help their children through the process as best as possible. *The concerns are similar for student-athletes who are already in high school; however, this discussion focuses specifically on middle school students. **I think that it is important to mention that this option is less freely used by college coaches. While it is expected that students can and will change their minds about programs, it is often frowned upon for schools to change their minds about scholarship offers. It is not unheard of for a college coach to become blacklisted and viewed as untrustworthy by high school coaches after decommitting to a young student-athlete.